March | 2014 | Love Those "Hands at Home"
Can you spin straw into gold? What? You say that’s ridiculous, it only happens in fairy tales? And with the help of creepy little elves? 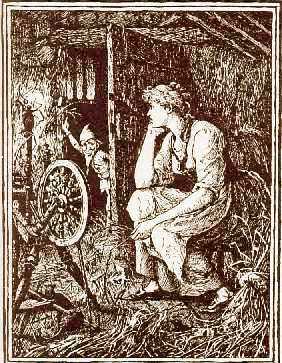 We probably all know the story of Rumpelstiltskin. The young woman in the story is tasked with the seemingly impossible, the magical—she is told to spin straw into gold. But that doesn’t happen in real life. And yet this morning, as I took plain, pale ingredients and cooked them into the molten gold of caramel, it occurred to me that spinning straw into gold is a metaphor for the creating we do with our hands at home. When the spinner takes flax (really, isn’t that basically straw?) and, in her hands, it becomes finest linen, that’s magic being made. When the weaver or knitter takes string and manipulates it into rich tweed or an Aran sweater, that’s magic being made. When the woodworker or the quilter or the cook takes bits and pieces, plain and unlovely, and transforms them into something as valuable as gold, magic is made. The magic comes from making something useful from the useless, something beautiful from the plain, something special from the quotidian. There was a time when people made this magic almost routinely, and out of necessity. If one wanted cloth, one likely needed to spin and weave it. If one wanted food, one cooked. If one wanted most anything, they made it. It was a do-it-yourself world. Today we don’t NEED to make much of anything. We can buy so much, so easily and so cheaply, often for far less than we could make it ourselves. And, yet, all indicators suggest that, for many of us, we don’t care if we can buy it. We want to make it. We want to do it ourselves. Why would someone in the 21st century spin her own wool? Bake his own bread? Build their own bookcase? I think the answer is that we believe in magic and we want to participate in the magic, to create the magic in our own world. Because when we make something with our own hands, we don’t just transform the ingredients into something different, we transform ourselves. We re-make ourselves from consumers—dependent on others for what we eat, wear, and use in our homes—into makers—competent, creative, individual. And if that isn’t magic, my friend, I don’t know what is. It’s time to get busy—go spin some straw into gold. My ancestors came to America as Protestant religious dissenters, with strict standards about productivity and frugality. It may be this Puritan heritage or my own nagging sense that one’s time in life is not unlimited, but I really like to be productive and to have something to show for my time. I am a firm proponent of the philosophy that idle hands are the devil’s playground. Having said that, recently I was stuck for TEN HOURS in an airline terminal, completely unprepared and completely unproductive. I just sat and read a free mystery novel on my tiny little phone screen and didn’t get anything done. At all. That was ten hours of my life that I’m never going to have back again! It made me crazy and completely determined to never be stuck in that position again. I don’t think I’m alone in this desire to get things done–I think a lot of you are right here with me. I read about your projects and hear about your creations. You’re not sitting around, twiddling your thumbs. When we’re home, you and I can choose among many different activities to engage our hands and our minds. We can sit at the sewing machine or quilting frame. We can stand over our stoves or toddle out to the jewelry studio or the garden. But when we’re away from home or just want to work outside and enjoy the weather outside (and all the weeding is done), we need a portable project. And I have the perfect portable project for you! Perfect portable projects should meet certain requirements—they need to be small so as to be, you know, portable. They need to require very few tools or supplies; none of the tools should be the kind of thing to be confiscated in an airport screening. They need to be easy to pick up and put down at a moment’s notice, just in case they ever make the announcement that your flight is boarding. I’ve always thought yo-yo quilts were absolutely charming. They evoke the 1930s and 1940s, and vintage ones are usually made of bright and cheery fabrics, with small, quirky prints. 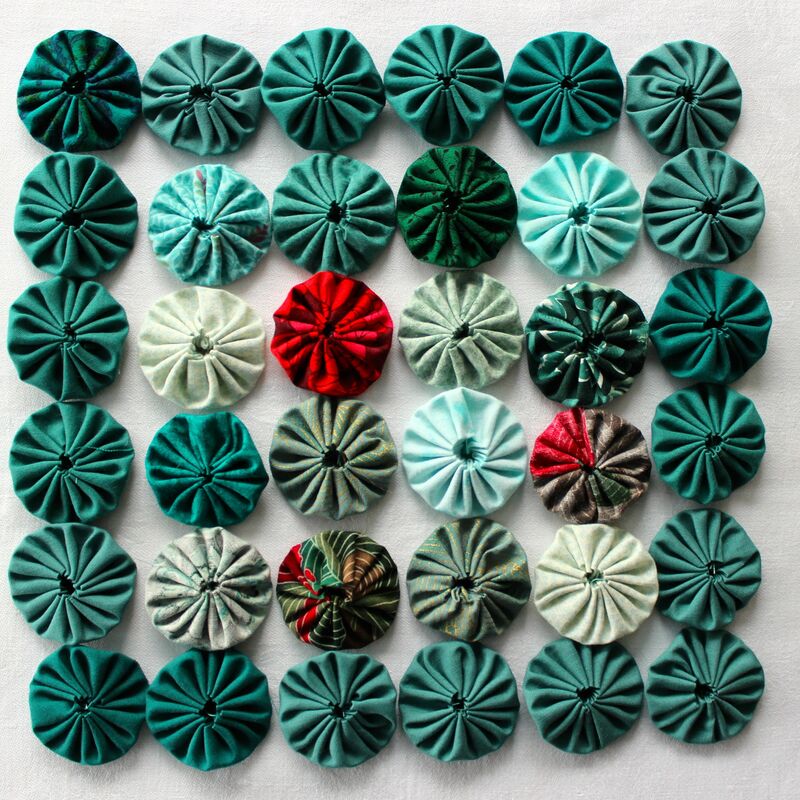 Yo-yo quilts are not really quilts at all—they aren’t layered with batting and backing and there is no actually quilting on them. 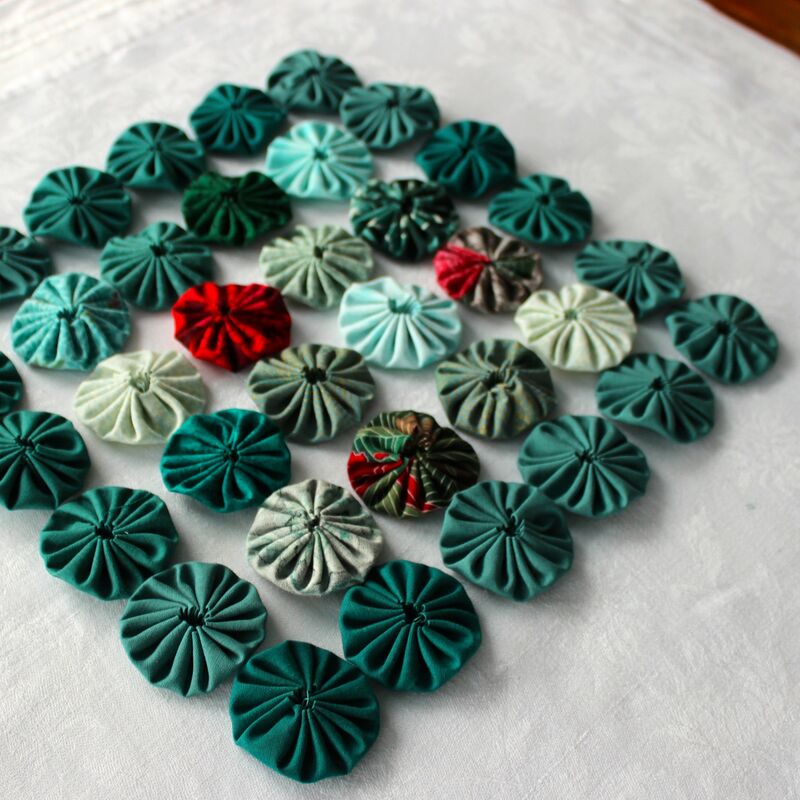 They are made from small scraps of fabric (the Puritan in me LOVES using small scraps of fabric! ), cut in circles. 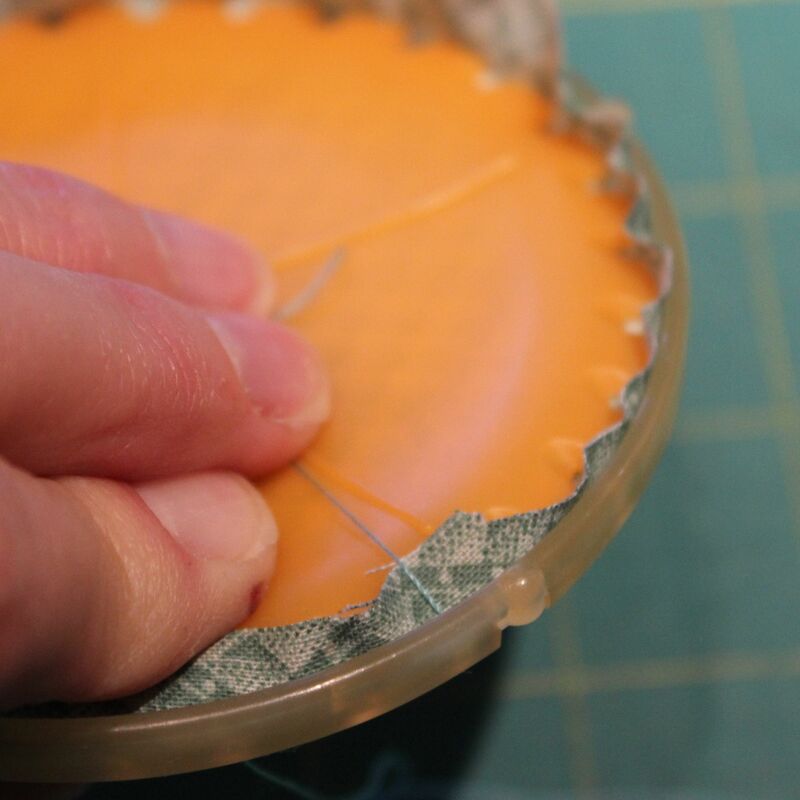 The edges of the fabric are folded over, stitched around with a running stitch, and then, when the two ends of thread meet, they are pulled to pleat the fabric together to form a smaller, double-layered circle that looks like a yo-yo. All the little yo-yos get stitched together to make a coverlet or throw. Like I said, I’ve always thought them charming but hadn’t ever tried to make one. Something about handling the fabric rounds and trying to press the edges under and hold it all together while I stitched just made me feel all angsty. But the gizmo solved all that. 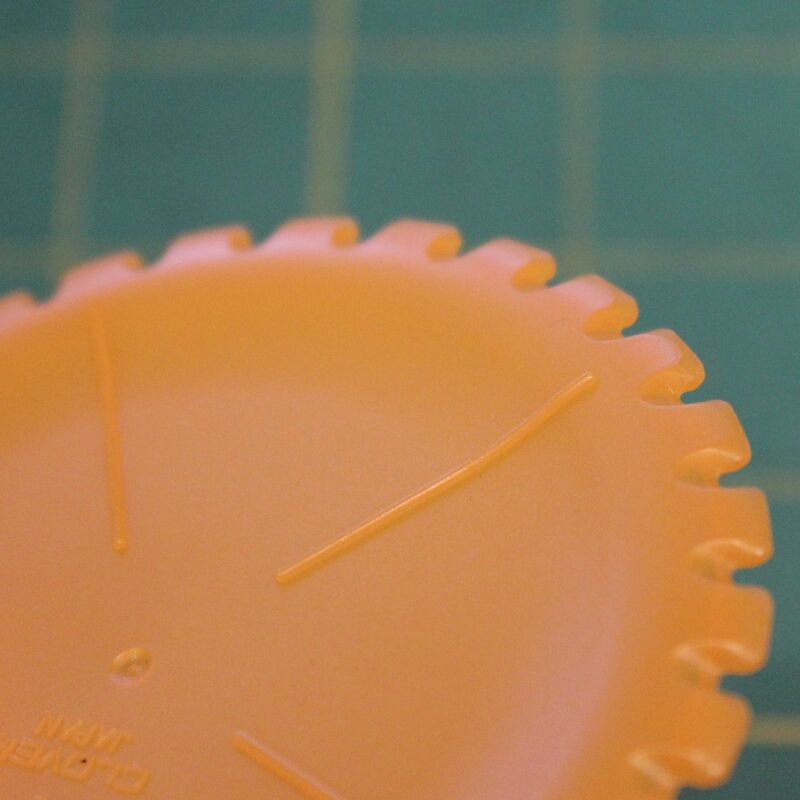 The gizmo consists of two pieces of plastic, a rimmed circle with a notched circle that fits inside. These come in five different sizes to produce round yo-yos anywhere from ¾ inch (about 2 centimeters) to 3 ½ inches in diameter (about 9 cm). You can also buy similar gizmos to make other shapes—like hearts and butterflies—but, as a staunch traditionalist and Puritan, I don’t approve of those! I like the little yo-yos. So, I bought a yo-yo maker (for a Puritan-acceptable $6). And I found that, with minimal prep time before I left home, I had the perfect portable project. I want you to have it, too. 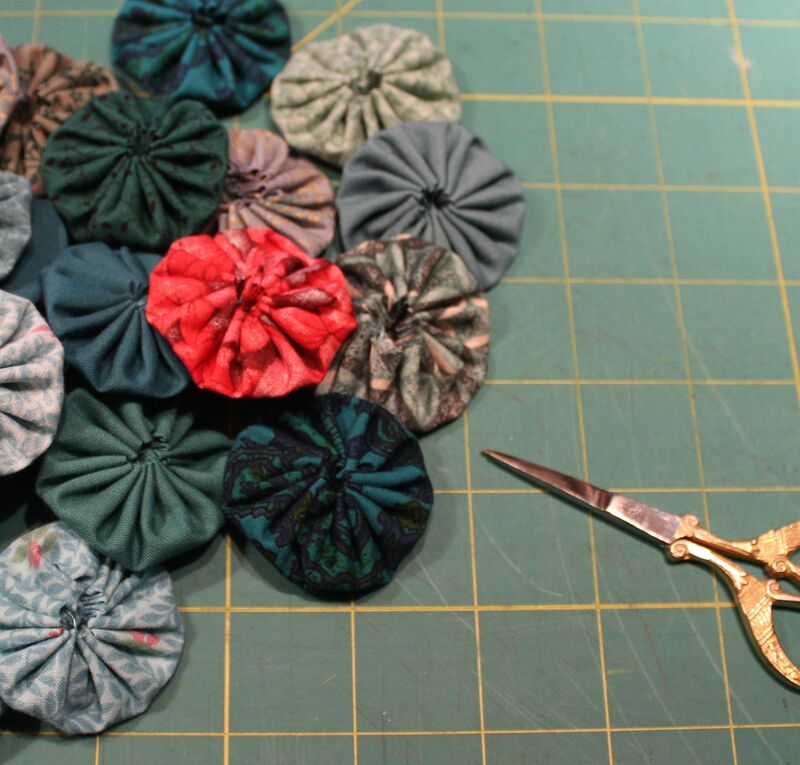 I started by using my rotary cutter and mat to make 4-inch (10.25 cm) squares of scrap fabric. You don’t have to be too precise about the measuring because the corners are going to be cut off anyway. The directions that come with the yo-yo maker suggest you should make the squares bigger but 4 inches works just fine. Puritans don’t waste fabric unnecessarily! The piece with the rim is the exterior piece. 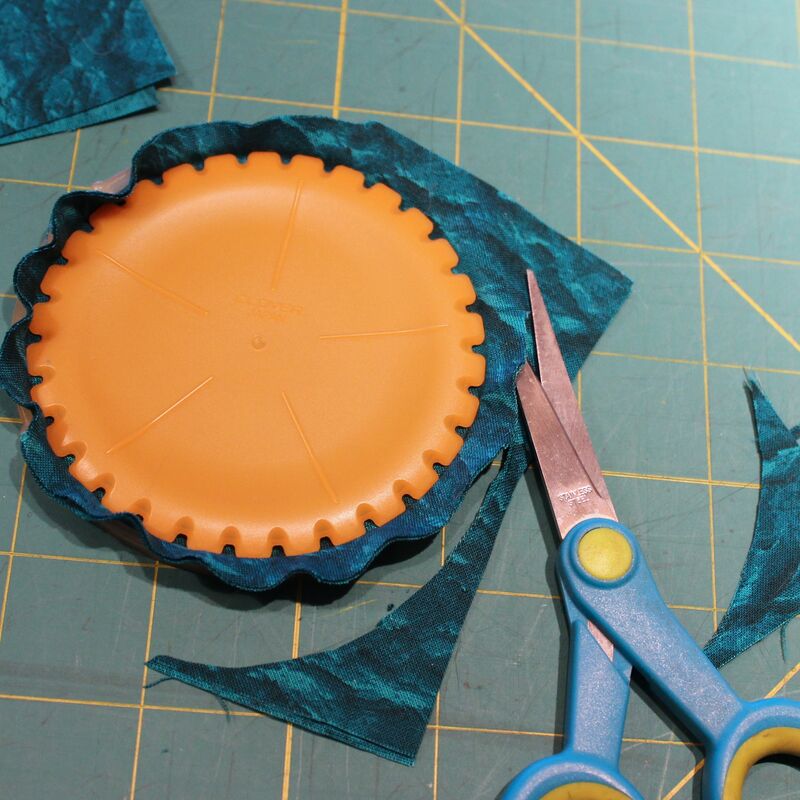 Put a fabric circle over the exterior piece of the gizmo. You want the RIGHT side of the fabric facing down. Snap the interior piece of the gizmo into the exterior piece, paying attention to two details. 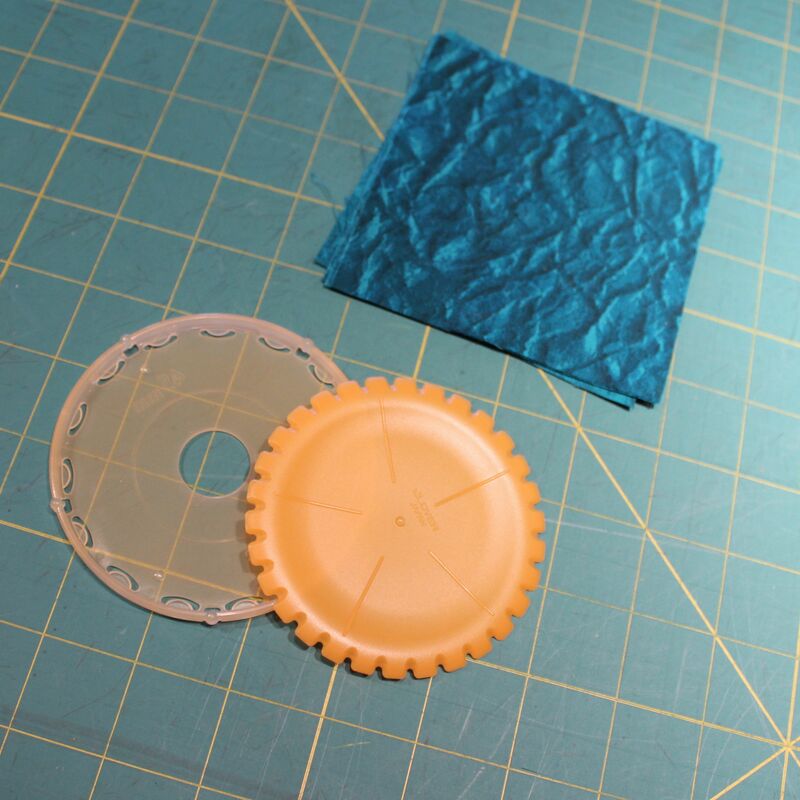 One, you want the fabric centered so you have a small, even rim of fabric all around. Second, make sure one of the radiating lines on the interior piece is aligned with one of the little knobs on the rim of the exterior piece. Once you get your fabric piece situated, you’re going to turn the whole thing over and look at the exterior piece as you stitch. Thread your needle with a rather long piece of thread—I use about a yard to start and can do a few yo-yos with that length. Don’t knot the end of the thread. Keep the EXTERIOR piece facing you (look for the hole in the middle) and notice the little crescent moon-shaped openings. Your stitches are going to come up on one side of the opening and down on the other. Make stitches in every opening, all the way around. When I reach the starting point, I make one more tiny up-and-down stitch right next to where my first stitch began—this seems to make it easier to pull the threads in the next step. Pop the two pieces of the gizmo apart. 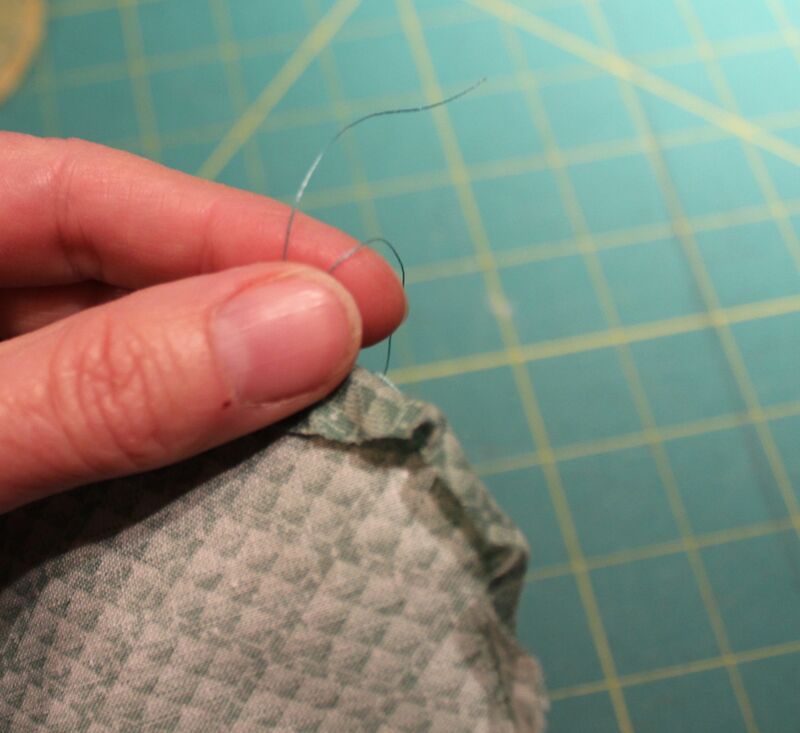 Carefully remove your fabric piece from the interior piece. 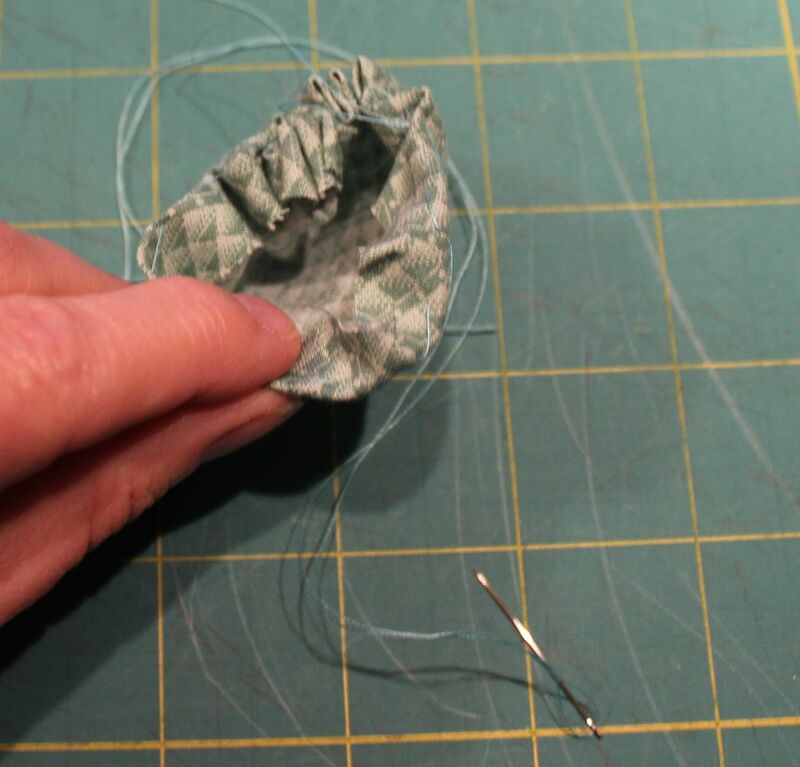 Hold both pieces of thread between your fingers and pull the long piece* to begin to gather the fabric. 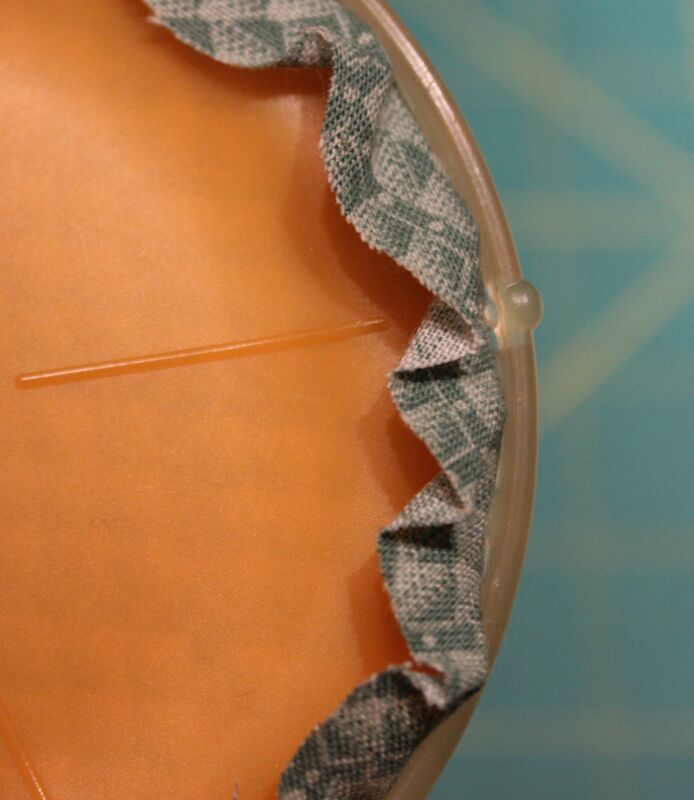 As you gather the fabric, the yo-yo might start to go inside out and the raw edge of the fabric may show. 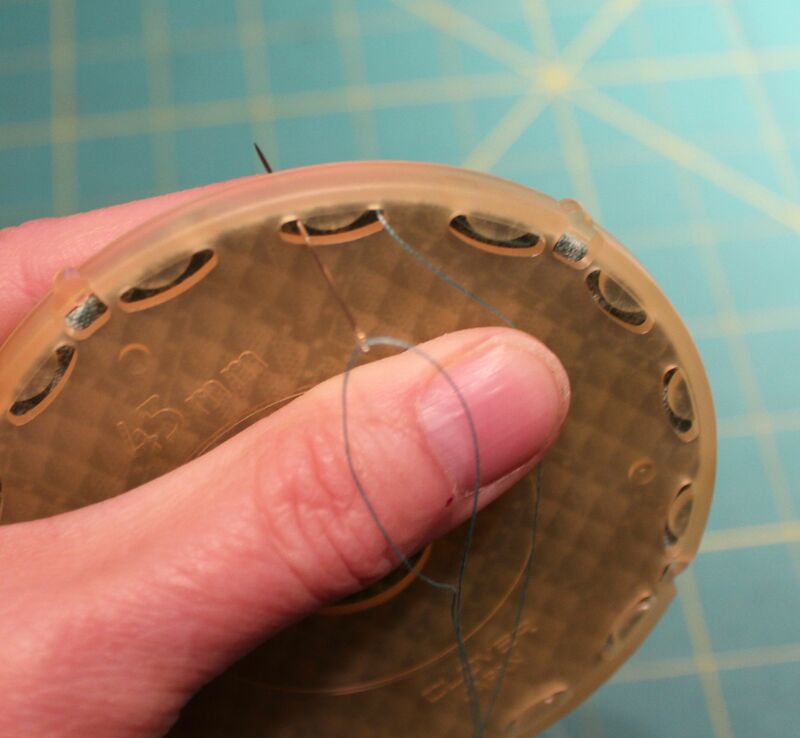 Just use your fingers to get everything going the direction it should and gently pull the threads some more. You’re aiming to pull hard enough to get everything gathered into a nice, small hole but not to pull so hard as to break the thread. Tie the two ends of thread together in a sturdy knot. Clip the ends leaving a little extra and bury the short ends inside the yo-yo. 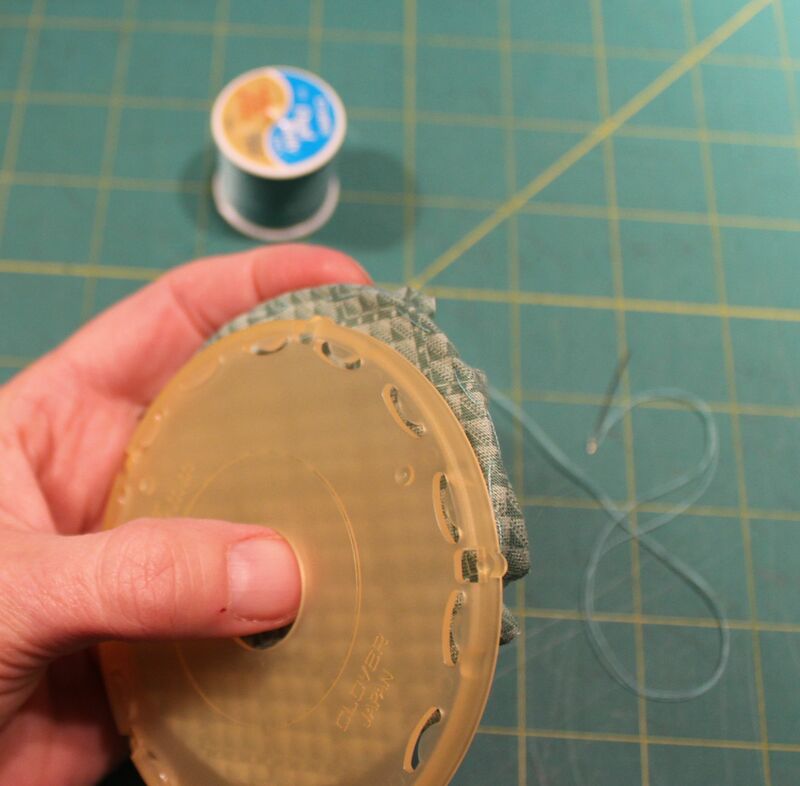 If necessary, use your fingers to tweak the fabric yo-yo to make it symmetrical and perfect. Isn’t it the cutest thing you ever saw?! But it’s lonely so you need to make more! I assure you that, after you’ve done 4 or 5 of these, it will take much less time to make one than it did to read this post. And you’re ready to hit the road with your perfect portable project! 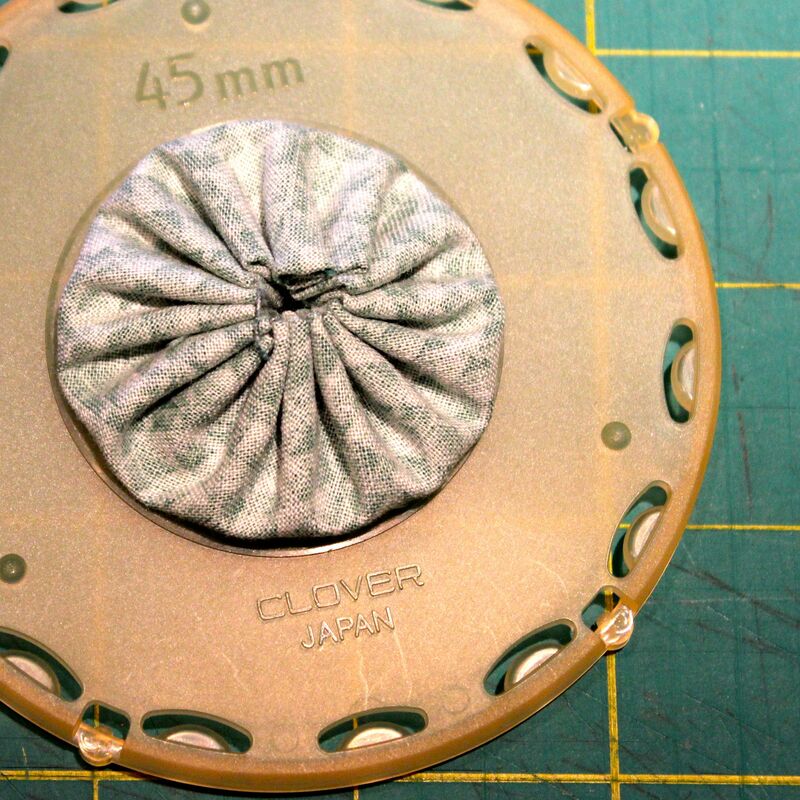 Put a stack of round fabric pieces and the gizmo into a zip-top plastic bag. Add a needle and a spool of thread. If you’re traveling by plane, put nail clippers in the bag; otherwise, take a small pair of scissors. I add my thimble because I can’t sew without a thimble! That’s it. You’ll be pleasantly surprised, I think, by how fast these yo-yos pile up. I got about 75 done in a few days, while I was on my trip, just picking them up at random moments. I never did work on them in the airport—we had no flight delays—or on the plane. Just random moments when idle hands might have led me astray. 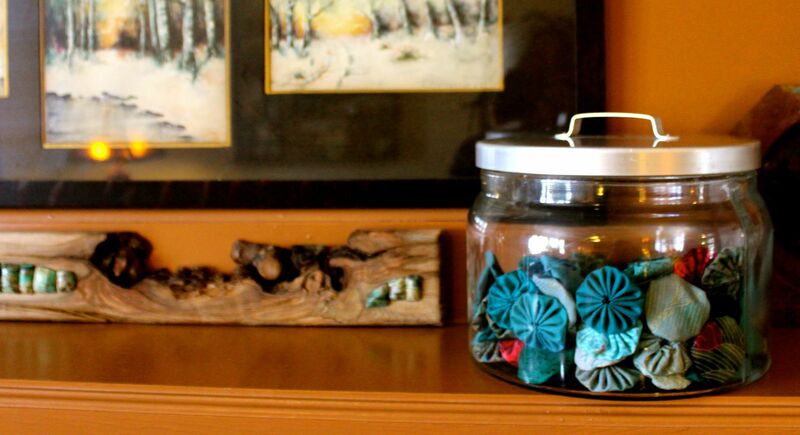 Are you wondering what to do with your darling little yo-yos? I found that 36 of my yo-yos make a square of about 10 inches (about 25.5 cm). 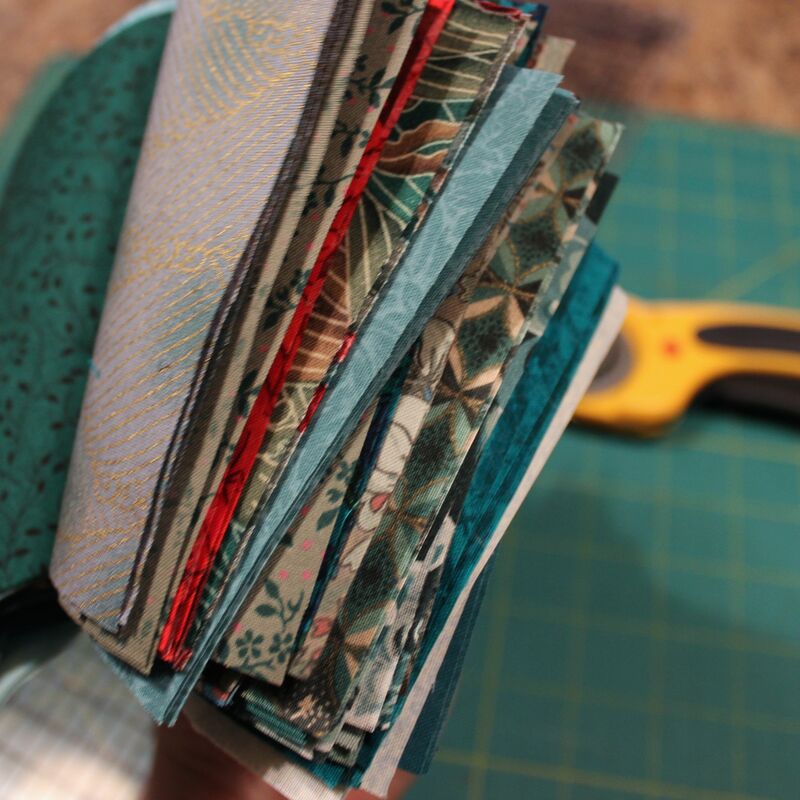 I’m in no hurry to finish anything—I have lots of scrap fabric and want to keep the portable project going. So I will probably just keep stitching away until I can make a traditional coverlet with mine. In the meantime, I’ll just enjoy their pretty simplicity. But there are almost innumerable other ways to enjoy your yo-yos! Aren’t these fun ideas? Can’t you feel your fingers itching, eager to begin? What are you waiting for? If I have completely confused you but you still want to give this a try, please let me know what questions you have! * You can pull both ends but, as you’ll see, doing so wastes a lot of thread and Puritans don’t waste thread. Not Your Grandmother’s Crochet . . .
One of the best things, to my way of thinking, about the so-called “traditional” crafts is the ease with which they can be adapted to the sensibilities of new generations and eras, not to mention locales! 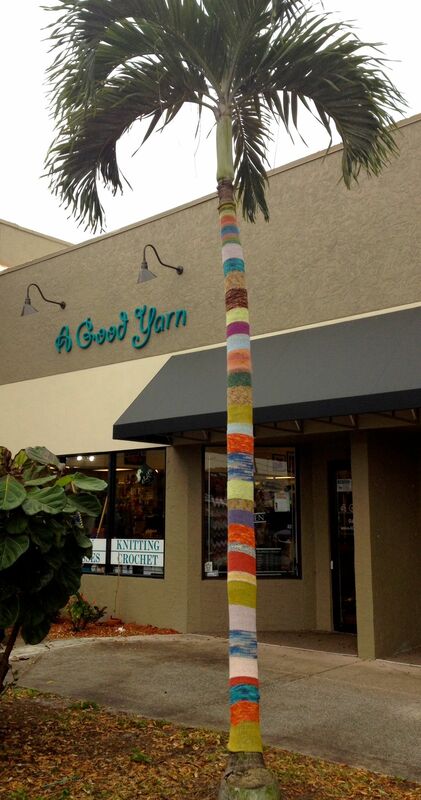 Have you done any yarn bombing? I’ve finished another stage in my “Cot to Coffin” quilt for the War of 1812 Bicentennial challenge! The top consists of three sections—a large panel with embroidery of the Great Seal of the United States, a section with the title of the song, “The Banks of Champlain,” and a bottom section made up of six embroidered verses of the song. 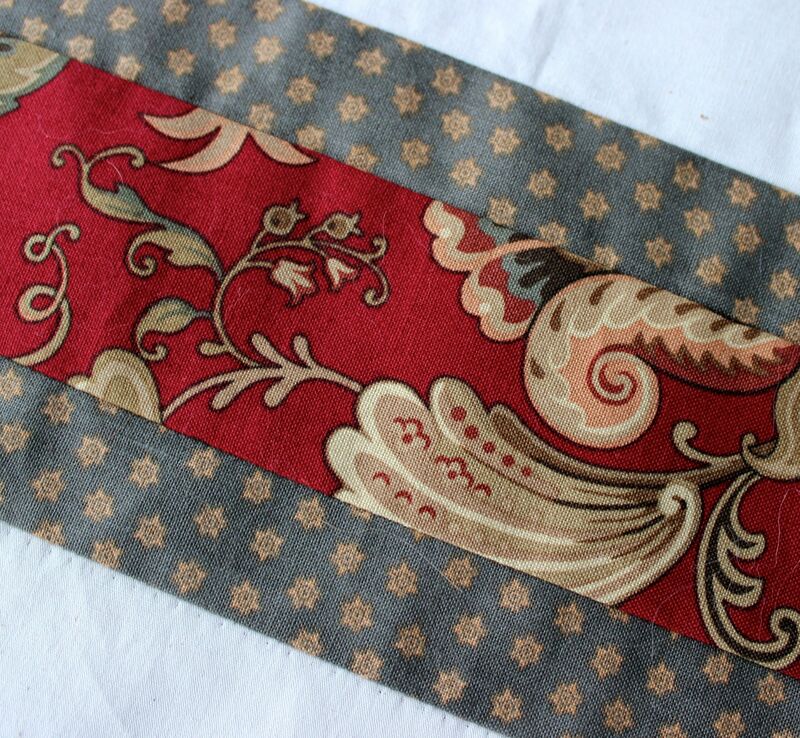 The three sections are bordered with narrow strips of a blue-gray fabric and finished with wider bands of a deep red paisley fabric. My plan, originally, was to render the design of the Great Seal in white-on-white quilting only. As I progressed and made choices about fabrics, I began to doubt that choice. From a distance, the quilt would’ve looked blank on top, with only the panels with the words showing up. So, I decided to embroider the simple outline of the Great Seal in the same stitch I used on the rest—the most basic embroidery stitch there is, the back stitch. 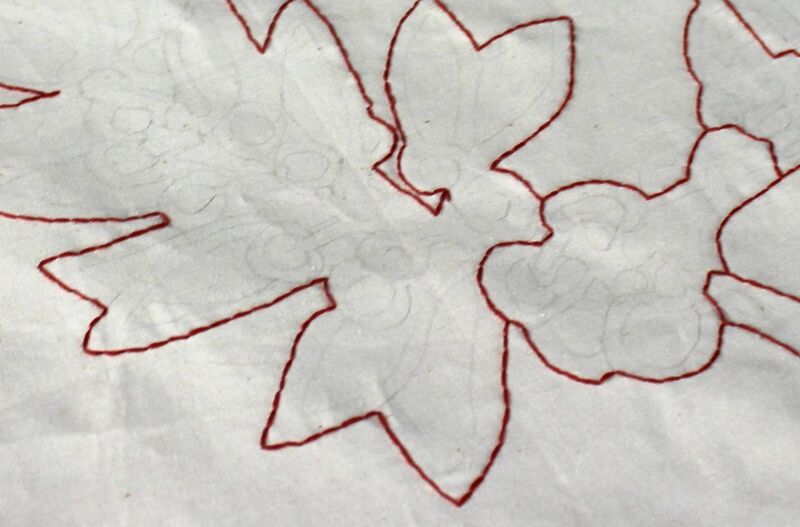 I will fill in the details of the seal design with quilting. To transfer the design, I got it blown up to the desired size and put the fabric panel over the design and traced it. I did the same with the words to the title of the song. 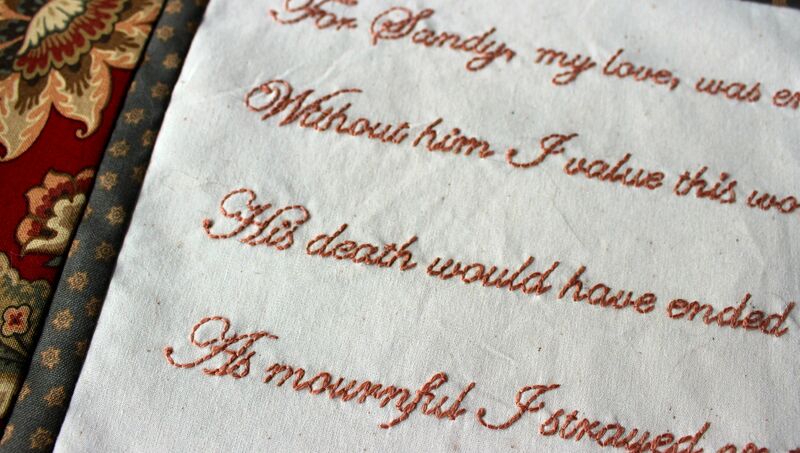 As I’ve said before, I transferred the verses of the song to fabric using the freezer paper method. I used a font in Microsoft Word called Edwardian Script for all the lettering. I sewed everything together on my brand-new old Singer Featherweight, which I love beyond measure! From this point, I need to layer the top with the batting and backing fabric and baste them together. Then I will get started on the quilting, which I’ll do by hand—I’m not sure yet what the design will be. This project started when I heard about the challenge at meeting of the quilt guild on January 16. Doing the embroidery and making the top has taken about two months and I have about three months in which to do the quilting, in order to meet the deadline. That’s the sound of maple sap hitting the bottom of a sap bucket. It’s maple season in the North Country of upstate New York. The trees are tapped and the sap is running—it’s a fleeting, special time of year. As you may know, it takes something like 40-45 gallons of sap to make one gallon of maple syrup. The sap is collected from taps in sugar maple trees and brought to a specially-designed sugarhouse, put in a specially-designed evaporator, and boiled down until it reaches a specially-designed syrupy goodness. That boiling takes a long time, with a lot of tending of the fire that fuels the evaporator. While this tending needs to be constant, I especially remember my father and grandfather watching the fire in the evenings, after dinner and after all the other farm chores were done. And I remember myself at 5 or 6 years old, sitting quietly in a dim corner of the warm, steamy, sweet-smelling sugarhouse. I sat and listened to the voices of the men. I could see the glow of lights from the farmhouse where my mother and grandmother worked to clean up from dinner. I can remember feeling so secure; everything was perfect in my world. Is it any wonder the sound of sap dripping is etched in my memory? 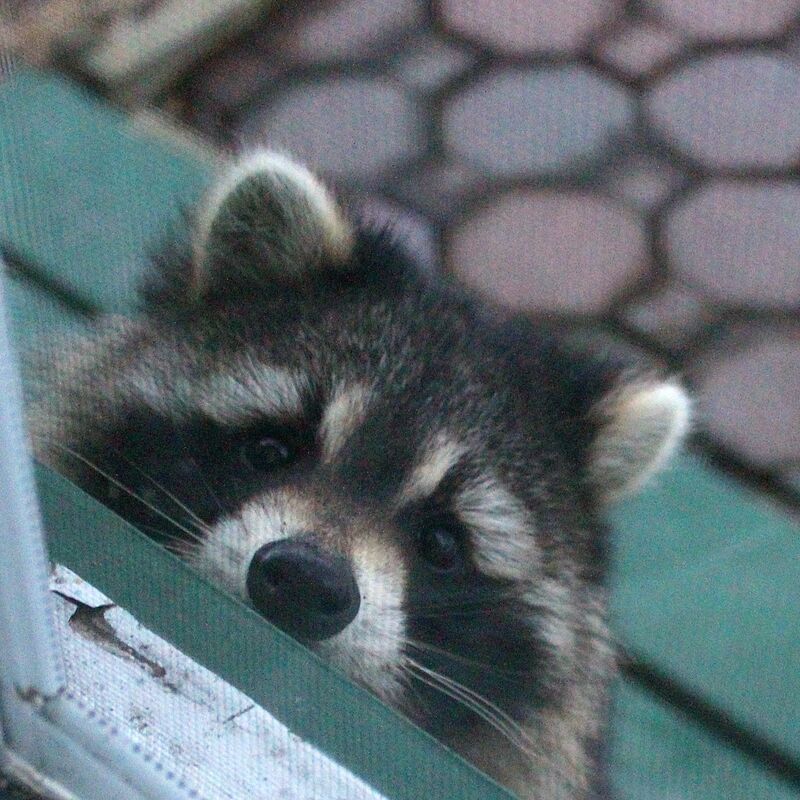 A sweet-faced raccoon stopped by for a quick visit recently. When winter gets to be just too much, a trip to a sunny, tropical place is in order. The bright yellow warmth of the sun, the smell of citrus, the taste of fresh fruit on the tongue . . . ahhhhhh. You can’t get away? Are obligations keeping you home? Is winter driving you to drink? The answer, my friend, is limoncello. We just got back from Florida. It was wonderful to go and we had a lovely, restorative trip BUT the downside was we had to return to winter! The day we left, we got almost two feet of snow that we’ve had to deal with and more snow is falling right now . . . ugh. But our return to winter was tempered by a lovely glow from our kitchen closet. In there, among the light bulbs and vacuum cleaner bags, was a tightly sealed container of liquid sunshine. We came back to our homemade limoncello, ready for drinking after about 6 weeks of steeping. It is the color of early morning sun, a sun that promises full-blown heat later in the day but now just warms your skin. It smells like lemons off the tree, warmed by the sun, tangy but not sour, intoxicating. It tastes . . . well, it tastes like lemonade’s grown-up sister, sassy and kind of naughty, but lots of fun. If this all sounds good to you, you have choices to make. You can head out to the liquor store and buy a bottle of limoncello and have it today. Or you can make your own, in true loving-hands-at-home fashion, and have it ready in about 6 weeks. Or (and this is my favorite), you can do both, allowing you to have your limoncello and drink it, too. Limoncello takes just a few ingredients and a little work. Mostly, it takes patience. 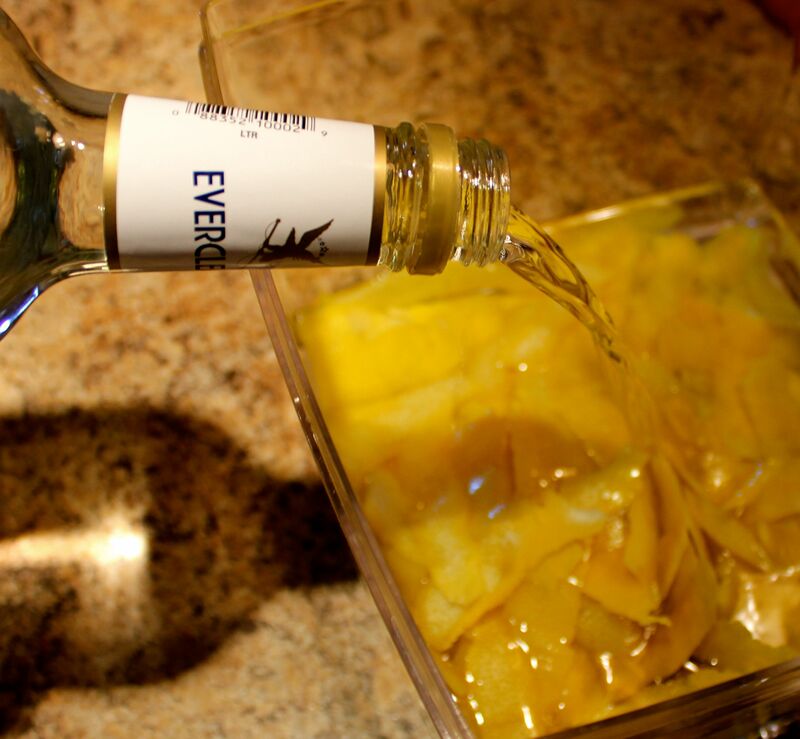 There are many recipes for limoncello on the Internet. We chose this one because the bag of lemons we bought contained 15 lemons and the recipe called for 15 lemons. It seemed like a sign. The only semi-difficult part of making limoncello is zesting the lemons. You want to get just the yellow of the peel, with none of the white pith. The pith will make your limoncello bitter. Wash the lemons in warm water. We found that a sharp vegetable peeler worked best. We cut off the ends of the lemons and peeled from top to bottom. With some pieces of peel, I needed to scrape a little pith off, too. You use only the peels for the limoncello. Use the lemon juice for lemonade or other purposes. Place lemon peel in a large glass jar with a lid. * Add your choice of Everclear grain alcohol or vodka. Cover the jar and put it somewhere cool and dark. Let it rest at room temperature for at least ten days. You can let it sit longer, up to 40 days, and that supposedly improves the final taste. I wouldn’t know. After 10 (or more) days of allowing the lemon oils to release into the alcohol, you will make a simple syrup of sugar and water. Place 4 cups of white, granulated sugar in a large saucepan with 5 cups of water. Stir well as you bring the mixture to a gentle boil. 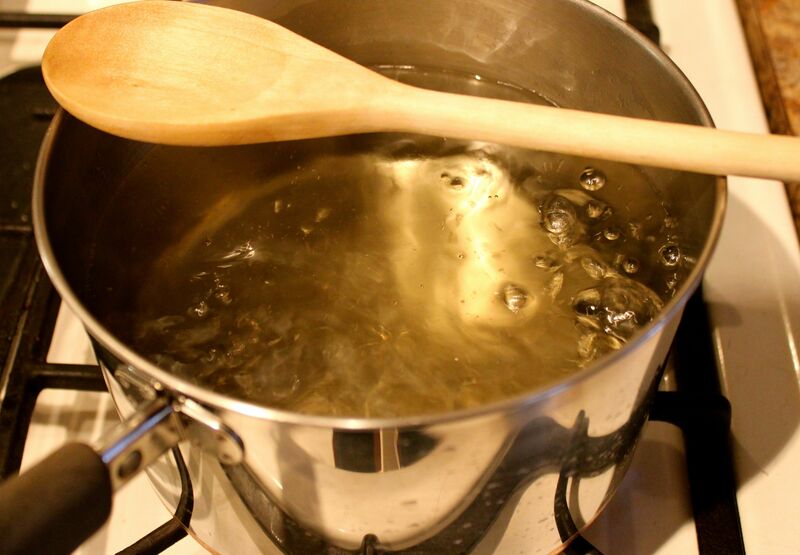 Allow to boil for 5 to 7 minutes, then remove from heat and let the syrup cool. Once cool, add the simple syrup to the lemon peel and alcohol jar. Give it a good stir and put it back in the cool, dark space to sit for another period of 10 to 40 days. This will bedifficult—it smells so good! The last step is straining the limoncello and bottling it. We used coffee filters to strain the mixture. 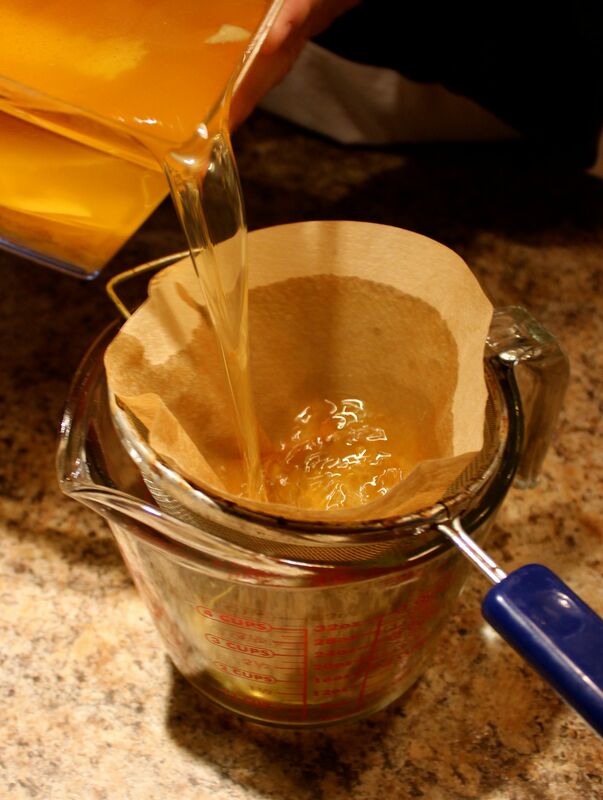 Place a coffee filter into a metal strainer and carefully pour in some of the mixture. It strains slowly, I think because of the oils you are removing from the mix. We replaced the coffee filter frequently. Pour the strained, and beautiful, liquid into a pretty bottle. Pretty bottles–a nice gift for someone! Seal the bottle tightly and store in the freezer—it won’t freeze with all that alcohol in it and it tastes great when it is super cold. You’ll end up with a generous amount of this lovely drink so use your imagination about ways to enjoy it. Obviously, you can also drink it straight out of the freezer (but preferably not straight out of the bottle! )—it’s a perfect after-dinner drink because it’s so light and fresh-tasting. I like my limoncello over crushed ice, like a grown-up slushie, or you can mix it with tonic water for a lighter treat. It’s also lovely mixed with champagne and can be used as an ingredient in other cocktails. But limoncello is not just for drinking! Pour a little over fresh fruit salad or berries or try drizzling it over lemon sherbet. I’m thinking it would be perfect in a traditional trifle, layered with pound cake, fruit, and custard. Or you could make a boozy pound cake—when the cake comes out of the oven, use a skewer to poke holes in it and drizzle the limoncello over. Do I have good ideas or what? Whatever you do with your limoncello, save some for the next cold, nasty day, that day when you feel that winter will never end, and you long for a warm breeze and your toes in the sand. 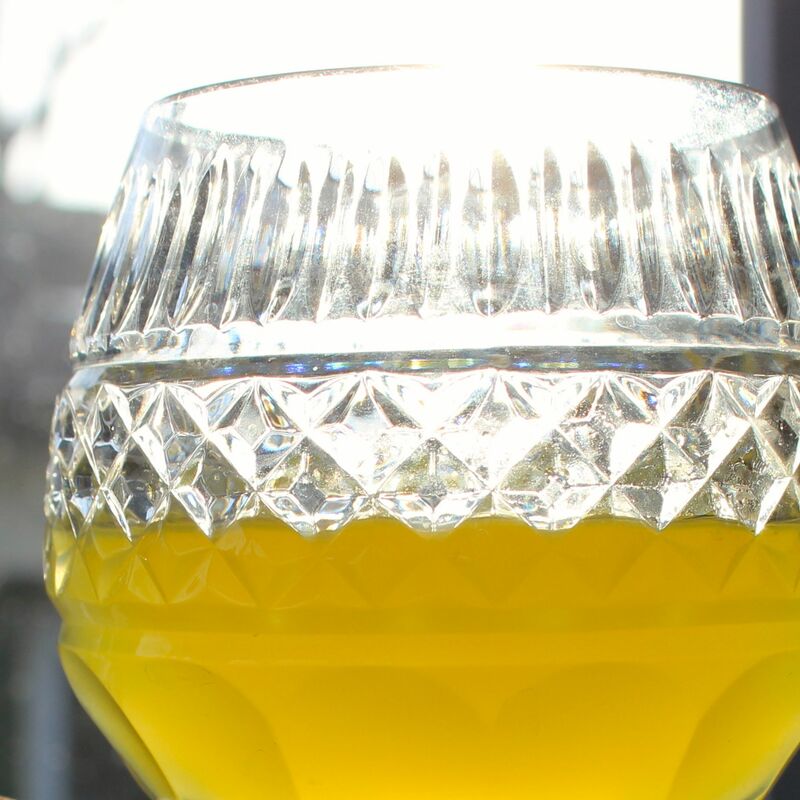 Put your limoncello in a small, pretty glass, close your eyes and sip. You’ll be transported. I think I need some right now! * We learned the hard way why glass is important. 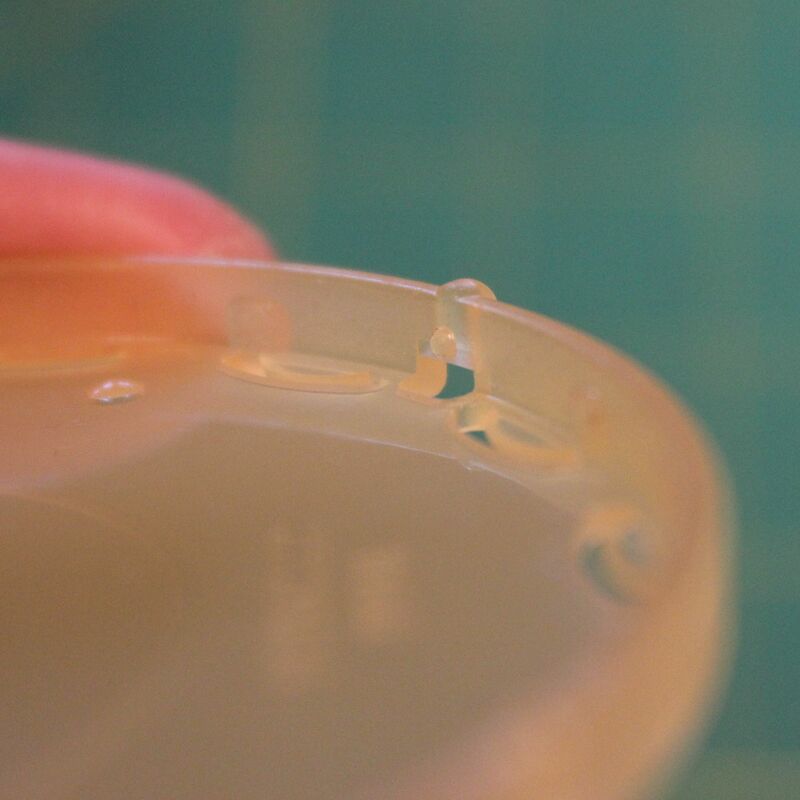 We used a plastic container and found that the oils from the lemons adhered to the plastic in what seems to be a permanent way.